Infinite Damask rugs, this award winning range of rugs and runners won 'Home product of the year'. Infinite damask rugs are eye catching and stunning, this contemporary range features ultra fashionable colours in an old favourite Damask pattern. Each rug is handmade in China using soft heavy weight 100% acrylic pile, the rug is hand carved to give a crisp textured finish. 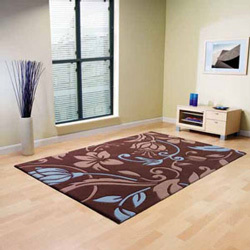 This range is available in 8 sizes including runners and circles in selected colours.